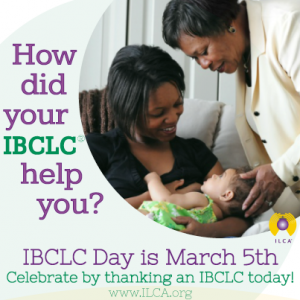 Today (Wednesday March 5th 2014) is the annual IBCLC Day, and the membership of the Association of Lactation Consultants in Ireland (ALCI) is delighted to celebrate this event with friends and colleagues worldwide. International Board Certified Lactation Consultants (IBCLCs) are healthcare professionals with expertise related to breastfeeding. The first IBCLC Day was celebrated in August 2002 and was started by the International Lactation Consultant Association (ILCA) to recognise and celebrate the value of IBCLCs. Each year, a different theme is chosen to celebrate the many and varied ways that IBCLCs support breastfeeding babies and mothers. This year’s theme is “Honouring the Ways that IBCLCs Help Families” encourages everyone to take a moment to share their gratitude for IBCLCs. In order to become certified, all IBCLCs have extensive training through coursework and clinical practice hours, and they have passed an internationally recognised exam. Because of their training and required continuing education, IBCLCs are knowledgeable about evidence-based practices and experienced in managing a wide variety of complex breastfeeding situations. They provide information and discuss queries during pregnancy, help mothers establish breastfeeding, and provide assistance with any challenges that may occur. IBCLCs also train other health workers, educators, policy makers and others so that they may support breastfeeding. As allied health care professionals with the only internationally-recognised credential for professional lactation services, IBCLCs work in hospitals, clinics, private practice, community settings, health promotion programmes, education and in research. Pregnant women, parents and health workers can find an IBCLC who is working in Private Practice in Ireland here. There are nearly 200 IBCLCs currently certified in Ireland and more than 26,000 IBCLC certificants in 94 countries worldwide. The IBCLC is certified by the International Board of Lactation Consultant Examiners® (IBLCE®), which is accredited by the U.S. National Commission for Certifying Agencies. As part of ALCI’s celebrations this March, there will be a study day for members in Limerick entitled “Oral & Physical Assessment – A Team Approach”. Anyone interested in attending is welcome to join ALCI and attend.